Providing safety critical fender systems, Doshin has a strong focus on producing all fenders in-house ensuring highest quality products. All manufacturing is done strictly in accordance with Doshin or customers’ specifications, drawings, calculations and quality requirements, in order to ensure a safe and reliable fender system. Testing is done as per latest PIANC guidelines, for special test protocols, please contact Doshin for more info. Doshin has an extensive proven track records of producing high quality rubber fendering products with our state-of-the-art test equipment including a combined shear and compression test press even for the largest fender sizes available. In addition to the performance verification testing, our certified laboratories check constantly all rubber batches used for the production of our high-quality fenders in order to verify compliance with material requirements for each single order. SPC Cone fenders have a very complex shape, making the energy absorption and reaction force ratio effectively higher than Cell fenders of the same size. Advanced materials, cutting-edge technology and advanced testing facilities play a pivotal role in the success of the Super Cone Fender at Doshin Rubber Engineering. 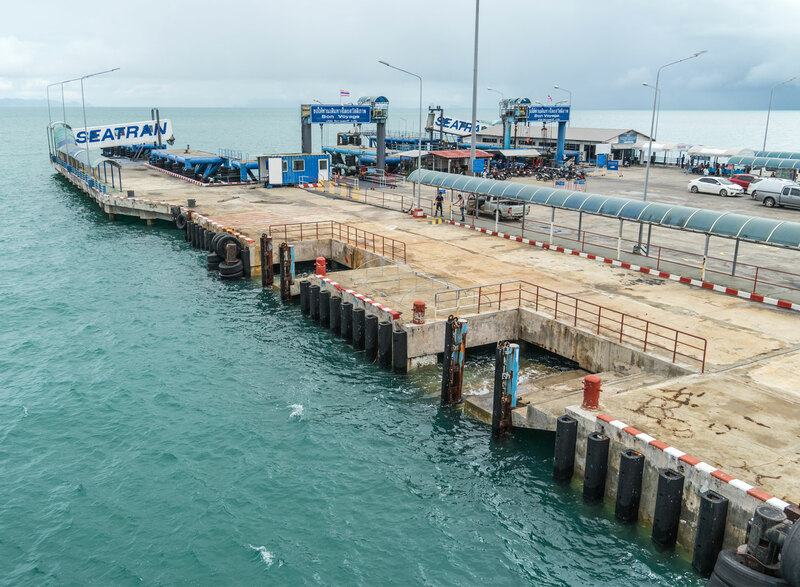 SPC fenders have been in service at ports around the world for many years, and especially very popular at container terminals due to their durability and performance. SPC Cone fenders are typically designed with frontal frame to allow for better distribution of stress across the hull surface and size are available between 300 and 2000mm. Doshin CSS Cell fenders are unique, having a high energy absorption to reaction force ratio as one of its salient features. They are cylindrical in shape with two steel mounting plates firmly bonded to both ends of the main rubber column during vulcanization. It is designed to deflect in an axial direction up to 52,5% (design deflection). It is the SX-type fender which is a narrow, excellent low reaction force and high energy absorption type. 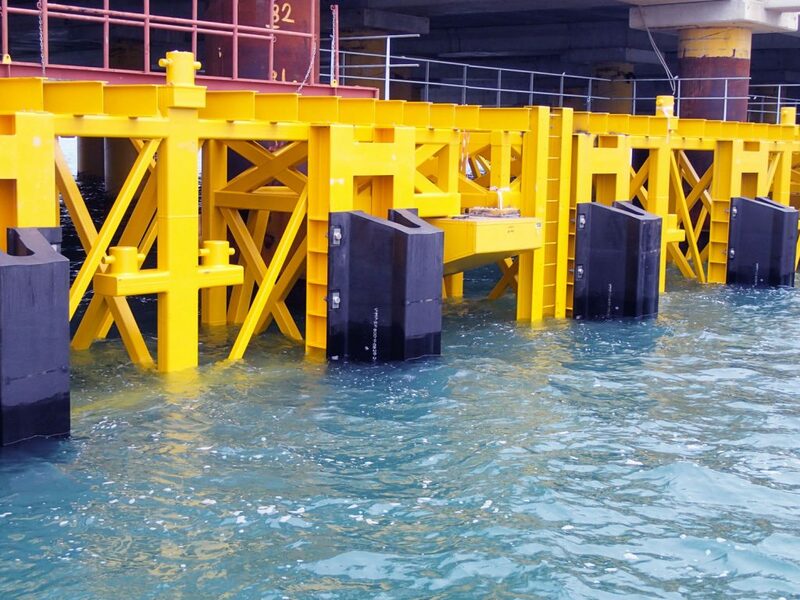 This is especially suitable for open-type piers with vertical piles and the like to which low reaction force type is advantageous to construction cost. 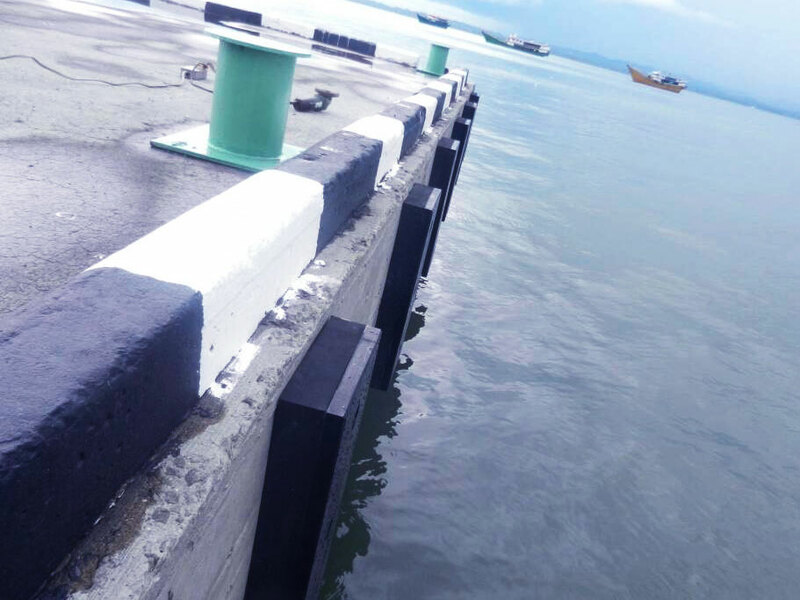 The use of impact-absorption plate and also can be equipped with UHMW-PE on the face of SX-type fender enables the plate to receive the local pressure from hull. The fender is so constructed that the local pressure is dispersed throughout the fender via the impact absorbing plate, damage to the fender by projections on the hull can be prevented, and stress is dispersed throughout the rubber part. Both V Fenders (SX and SX-P) are available in standard heights from 250 to 1,000 mm, in standard length ranging from 1,000 to 3,500 mm. 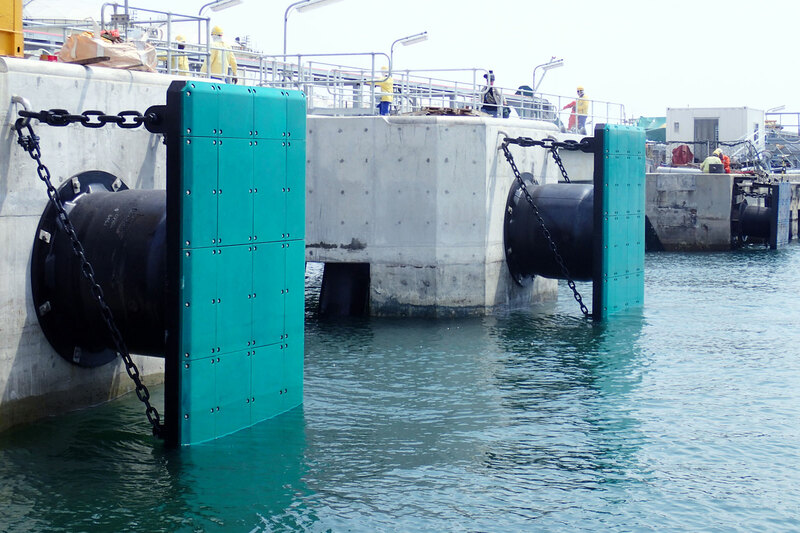 Doshin Cylindrical Fenders are a simple and versatile marine fender system and can be easily installed. 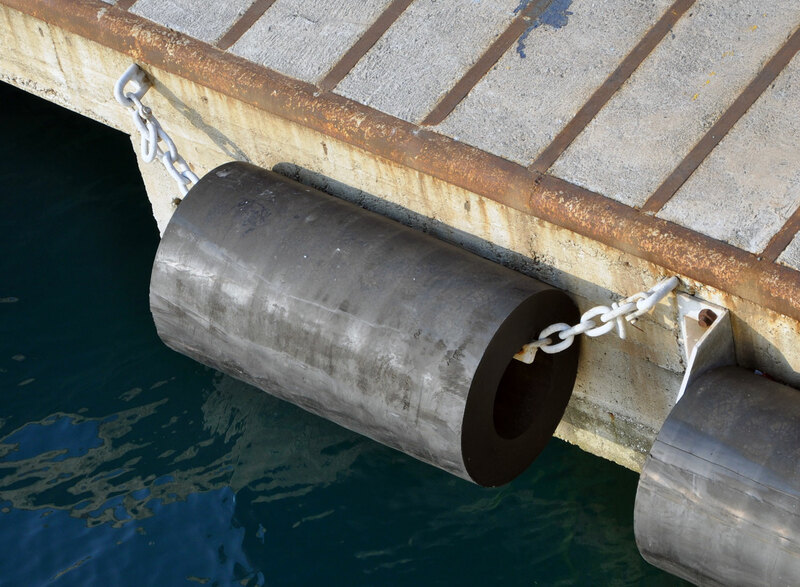 The Cylindrical Fenders’ proportional increase of reaction force and energy absorption all the way to the rated deflection is an advantage resulting in softer berthing. 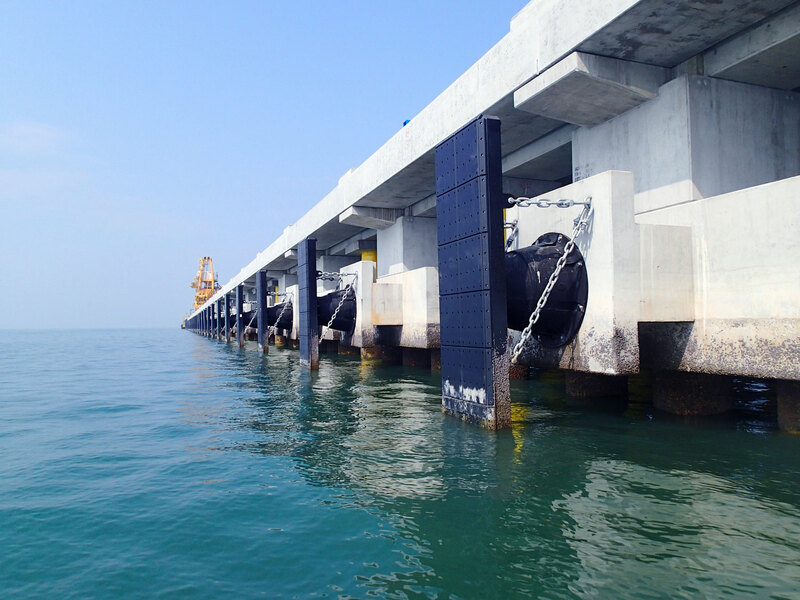 Our Cylindrical Fenders are available by Moulding process to ensure it is compact, solid and reliable. Moulding size can be up to 2000mm. For small size, extruded process is also available upon requested. Special dimensions and features such as pre-bending or jointing can be requested. Rigid Fenders ( DD, DC, SC ) have a D or Square outer form and either a D shaped center (DD type) or cylindrical center bore (DC Fender). Most of rigid Fenders at Doshin are by moulding process to ensure the best quality. Rigid Fenders are available in standard sizes but can be supplied at odd size upon requested by moulding process. Composite fenders are composites of rubber which provides resilience and UHMWPE with low friction and wear resistant properties. The two materials are bonded with a special vulcanising method which is stronger and more reliable than a mechanical joint. Composite fenders are manufactured through moulding process for best bonding strength between rubber and UHMW-PE.